Alpha Delta Pi collegians and alumnae, as well as friends and family members of Alpha Delta Pi, show their philanthropic spirit in many ways. Alpha Delta Pi sisters make an impact on their campuses and in their communities. 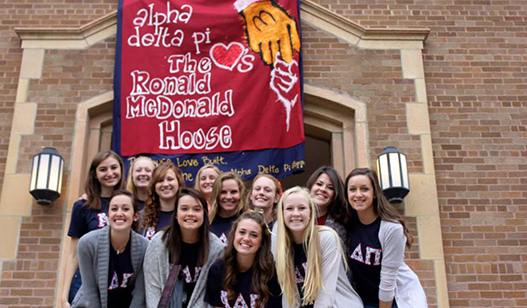 During the 2017-2018 academic year, Alpha Delta Pi contributed $1,468,414 to charitable organizations, including $1,344,838 to Ronald McDonald House Charities (RMHC) across the United States and Canada. We are proud of our long-standing relationship with RMHC. Since our partnership began in 1979, Alpha Delta Pi has contributed more than $14,000,000 to this worthwhile organization. Additionally, as part of the We Believe… Campaign, the Alpha Delta Pi Foundation has established the Ronald McDonald House Charities Endowment. This fund will allow the Alpha Delta Pi Foundation to provide even more resources to RMHC worldwide.